When you spend eight hours of your day in your office space, what are you spending your time on? We spend most of our time in the office sitting in our office chair, yet this piece of office furniture tends to be overlooked the most. An poor office chair can cut into productivity, cause distractions, and create extremely uncomfortable work days. You can even begin to experience health problems with your neck and back if you don’t invest in a proper office chair. So what should you look for in your new office chair? The first component of your office chair to consider is the height. Ideally, your office chair should be able to be adjusted so that you are able to sit up straight while keeping your feet on the floor. Your arms should also be kept at the same height as the desk you are working on. Sitting too low or too high at your desk could cause discomfort in the spine, legs, arms, and neck, which can negatively impact productivity. You should then consider the type of lumbar support your office chair can provide. Because you will be spending countless hours sitting down, your lower back will need support to prevent pain and ache. Different body types require different levels of support, so be sure to test your chair out before you make a purchase. 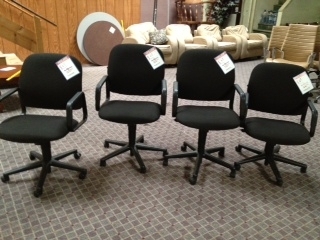 Your office chair should also come with the ability to recline as well as have arm rests. A reclining back that can move to 135 degree angle can help release stress from your back and make you more comfortable. Arm rests are used to help prevent stress on the arms and shoulders while sitting. This entry was posted on Sunday, June 21st, 2015 at 3:11 pm. Both comments and pings are currently closed.